It’s the most wonderful time of the year! But you might be worrying how you’re going to keep a handle on your social media presence while your team members are taking time off to sip eggnog, unwrap gifts, or indulge in a bit of light gluttony with their friends and family. 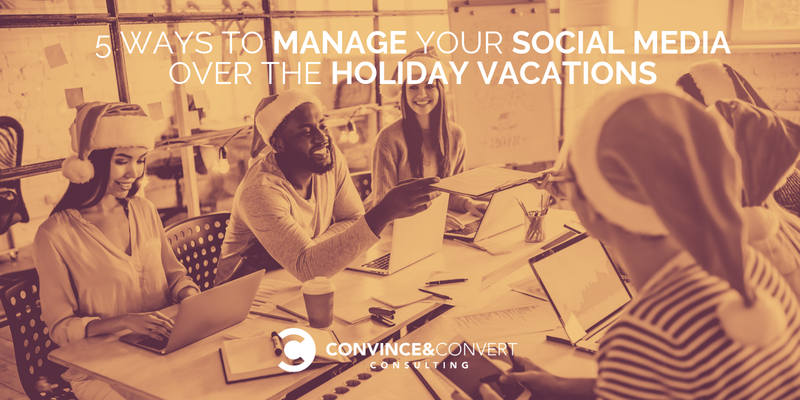 It may feel cruel that the season when most of your team is requesting vacation is also the busiest time for social media. Thanks to major shopping days like Black Friday and Cyber Monday, e-commerce is on the brain this time of year. Everyone is out there looking for the best deals and hottest brands, and they’re talking about it; social media traffic spikes a whopping 73 percent during the holidays! We know that most social media pros are hesitant to take vacation time. The nature of social media requires a nearly round-the-clock commitment, and people often put off taking vacation time to avoid being out of pocket. But with many companies nixing rollover for paid time off (use it or lose it! ), the end of the calendar year can bring a flurry of vacation requests and, with those, anxiety about how best to handle the workload. It’s a fine line to walk: you can plan your holiday promotions and marketing beautifully, but if nobody is around to respond to the irate customer blowing up your Facebook page on Christmas Eve, goodwill toward your business could all come crashing down. Last month, Jay Baer presented a fantastic webinar with our friends at ICUC.social on how to effectively manage social media during this most wonderful time of the year. Here is a recap of the best tips from Jay and ICUC. Shore up your social media plan by taking these five steps before the holidays descend on us in full force. Sit down with your team and go over your operations plan in detail. Give special consideration to how you plan to respond to negative comments and reviews during this time. Many of these customers may be finding your brand for the first time during their holiday shopping, so making sure that your tone, voice, personality, and speed of reply are on point is key to conversion and retention. You’ll also want to confirm that all passwords and permissions are set properly. Don’t forget things like software key codes—they should all be up to date and stored somewhere secure but easily accessible. Have each member of your crew write down as many possible nightmare situations as they can imagine happening during the holiday rush. It may seem silly, but this activity will help you prepare for the worst case scenario. These scenarios might include an occasion where the person with the Instagram password is totally unreachable because they’re on vacation in Bali. Or the credit card you use to purchase Facebook ads expires three days before Christmas, and everyone in the finance department is off the grid. Once you’ve made your list, go through it line by line and talk about how you would handle each situation. Of course, you never expect these sorts of things to happen, but you absolutely must be prepared to take swift and direct action if they do. This is a big one. 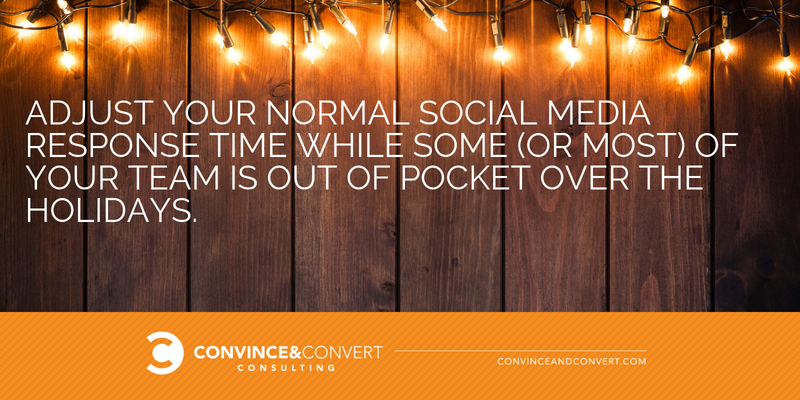 It may make sense to you to adjust your normal social media response time while some (or most) of your team is out of pocket over the holidays. There will be a big spike in mentions of your company, and you only have so much time in the day, right? If you usually respond in a few hours, consider doubling that time while you’re running things with a skeleton crew. Alternately, you may feel compelled to step things up. The volume of chatter is so high during the holidays, but so are the stakes. Do you really want to respond to customers more slowly than you normally would? If you want to commit to responding at the same speed you’re currently using, when your volume could possibly double or triple, figure that out now and make a detailed plan! You may not feel like you need a social media crisis plan — until you do, and then you need it badly! Don’t put yourself in a tight spot during the busiest time of the year, totally unprepared to handle a social media meltdown. Now is the time to review your crisis plan — and if you don’t have one, create one immediately—and make sure it is up to date and accurately reflects your entire social media universe. Confirm contact information for your entire team, and figure out who is next up to bat if someone is unreachable. You also may want to talk to other departments such as sales, operations, customer service, and PR. Members of other departments can help you anticipate anything negative that could happen before the year’s end that you might need to address via social media. Again, it’s incredibly unlikely any of these awful things will actually befall you. But do you want to be caught sleeping if they do? The reality for your company may be that there simply aren’t enough people to adequately cover your social media channels throughout the holiday season. You don’t want your team to sacrifice their break, and you aren’t keen on foisting a massive workload on just a few employees. But you also don’t want to miss opportunities to connect with customers and amplify your brand during the highest traffic time of year. Good news! There are social media pros out there whose job it is to be extra hands when you need them. They’re highly experienced and can handle content management, replying to comments and reviews, and even escalating customers to management if necessary. If this seems like the right choice for your company this holiday season, connect with the good folks over at ICUC.social. They’ll help you put a plan in place today, so your social media team can holly their jolly without worrying about things going off the rails! Plus, make sure to check out their Guide to Preparing for the Holiday Season.